Robin Uitgaansmode has a reputation for being the dress specialist for more than twenty-five years. 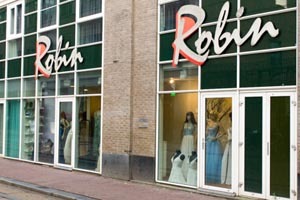 At the Robin shop you will find a very large collection of prom dresses and wedding dresses. We have glamour dresses and beautiful short dresses in which you can be seen. Our dresses are in a cheap price range with a very good quality ratio. The sizes dresses starts a the small size 28 and end with the big sizes 52. The dresses have a nice fit, where the female curves come into their own. Our collection with 1500 dresses is weekly complemented with new dresses. Robin has an extensive collection of prom dresses, evening dresses, wedding dresses, party dresses and dance dresses in stock. We also have affordable swarovski jewelry, evening bags and gala shoes for your dress. Visit our shop in the center of Amsterdam. Our regular customers from all over the Netherlands, Belgium and Germany. Come to Robin in Amsterdam for modern coloured dresses with a good fit. Our dresses have a good price quality ratio. What are the prices of the dresses in our store? The cheap cocktail dresses start at 49 euros and the prom dresses on the sale range from 100 euros to 250 euros. The stylish evening dresses are priced between 300 and 450 euros. A price tag between 500 and 600 euros is attached to the luxury, glamour prom dresses. Our collection of wedding dresses is mainly the price category between 250 and 400 euros. The highest prices can be found at a single designer dress around 800 euros. We also have affordable collection swarovski crystal jewellery, evening bags and shoes for your dress.